The main discussion of the power sector should focus on what are the challenges ahead, what are the impediments, whether the supply is being uninterrupted or whether the consumers are getting it at affordable prices. With the increase in power generation, the gap between demand and supply during peak and off-peak hours is widening. We have to think about how to narrow this gap. We have to try to utilise more daylight to ease demand pressure in peak hours as practised in some foreign countries. Industry can run in peak hours but we have to think of cutting commercial use of power from the evening. The main issue in the coming days will be how to provide power to people at affordable prices. Uninterrupted supply of power will be a major challenge. What is the country power demand? There is no end of demand. Per capita power consumption is now 500Kwh, but for any mid-income country it should be 1,200Kwh to 1,500Kwh. We have to go a long way if we want to be a well off nation. Health, education, lifestyle and many other things are associated with power. Unplanned urbanisation is a big challenge for the country. Without any future planning, there has been a mushrooming growth of industries in Savar, Ashulia and both sides of Mymensingh Road. REB struggles to give power connections to these industries. Unplanned and rural industrialisation will be a big problem for uninterrupted power supply. Now, the government has decided to allow industries only in planned areas. If industries do not shift to these areas, ensuring uninterrupted power will be very costly for them. Even, planned residential areas like Gulshan, Banani and Baridhara have turned into commercial areas, where power demand assessment has become very tough. Industries, especially apparel industry, should think about whether they will shift to planned industrial areas. From now on, power distribution companies must be strict that they will not give power connections to industries outside planned industrial zones. Other ministries should join our future planning for development. Other cities near Dhaka should be well planned as well. Detailed Area Plan (DAP) should not be only for Dhaka. It should be for the entire country. Otherwise, planning will be difficult and providing utility will be costly. I welcome objective criticism, which may increase our pace of work. All criticism should not be negative. Criticism should be in the way that can assist our work. Some questions regarding load shedding or power supply interruption have been raised here and I wish to answer them. We call it load shedding when we stop power supply because of our limitation, but we are not showing any load shedding [in official data] because now we do not have that limitation. It is the difference between you (analysts) and us. There are some localised problems which we cannot call load shedding. Yes, we officially admit to some load shedding in Rangpur and Rajshahi regions which are actually forced load shedding because of low voltage caused by Barapukuria coal-based power plant shutdown. So, we are not trying to make you confused. There is a policy question -- whether we will stop captive power or not. Captive power is mainly run on gas and used in industries. Energy efficiency of captive powers is 80 percent whereas that of power plants is only 56. Then what should be our policy-going for efficient or inefficient ones. It is our policy to maintain captive powers because of their efficiency. It is right that power generation increased by three times while consumption saw two times hike because our base load at the consumer level increased but industrial base load did not increase. For this, there is no scope of three times increase in power consumption because seasonal variation exists at the consumer level. On the other hand, industrials sector is habituated to delayed response. When EPZ was established in Savar, the area was nearly bearish. But after 10 years, the area was flooded with industries. Industries need large investment and any big investment wants a return. There was a criticism that quick rental power would make the country bankrupt. But in reality, the country saw an overwhelming development in the last 10 years because of that kind of power generation what we can be proud of. In terms of capacity enhancement, we have achieved a remarkable success. Last year, we completed processing of some fast track projects of $2.5 billion to narrow demand-supply gap in only 25 days and those were completed even before nine months. At the same time, we spent Tk 25,000 crore of the ADP money last fiscal year without increasing manpower, whereas we spent only Tk 2,500 crore nine years ago, which shows our capacity. Affordability is not a problem as power cost saw hike on eight occasions in last 10 years. Did people protest it? I personally think that people pleasantly pays increased price as their first priority is accessibility; not affordability. The government is now thinking out of box in terms of power generation partnership with big global players and floating procurement tenders. Although the government has ensured huge development in terms of power generation and power penetration, it has not become sustainable and the policy is not perfect. The government has not devised any concrete plan on the captive power generation till now just because of the lack of reliable power generation. They are developing the sector but there is no plan on the captive power. Then how will you bring them in? Do you want to reach the 2041 target depending on domestic use? The government is showing dream of industrial development, but captive power users are remaining out of purview, and then how will you pick up money? Price of power will go with the rising LNG price in future. Now price of power is ranging between Tk 5 and 10 per unit for industrial connections. Where will it go? It has to be addressed properly for the smooth growth of industrialisation. Many people are talking about load shedding, but why your (government) system does not show the real time information to the consumers. The government has achieved a lot in this sector, which is needed now. The government has showed success in the field of power, but it may not assume that consumers are hundred percent happy. If we talk about energy security for the power, it can be defined in three ways -- affordability, availability and accessibility. There is availability and has problems in accessibility but it is not defined to what extent power is affordable and there is no discussion on it till now. In the year 2008-09, gas was the primary energy for generation of 85 percent power and now it has come down to 58 percent. Thirty-two percent power generation using oil is a great key concern. As per the government plan, it is estimated that the use of oil in power generation will be brought down to 16 percent by 2030 and to 5 percent by 2041. Success of this plan now depends on the supply of other primary energy. At the same time, supply of other primary energy is the prime challenge for power generation and actually depends on coal and LNG. That means it brings financial challenge too. It is targeted to import 4 billion cubic feet per-day LNG by 2023-24 that will cost around $15 billion annually. So the cost of finance is a big issue and this is the matter of challenge. We have to establish land-based LNG terminal too; otherwise LNG supply may face problems for 15 days to 3 months every year. Problems are clearly identified and the government is aware of them but the delay in implementation is the key concern. Bangladesh has huge lack of skilled manpower and managers in energy and power sector. We have to lay focus on creating technical knowhow and skilled managers. We even do not have enough managers to operate a 1200-MW power plant. Seasonal variation of power demand is increasing day by day because of the use of air conditioners. In 2008, there was a 500-600MW difference in power use between summer and winter which now stands at around 5000MW. There is no chance to sit idle with this power and need to go for brainstorming to minimise the variation. I would like to thank all of you for taking a lot of pains to join today’s programme. I am really grateful to all as you have spared some time for us out of your hectic schedules. It is Prime Minister Sheikh Hasina whose vision helped bring about a tremendous progress in the power sector of the country. After assuming office in 2009, the Prime Minister made power generation a priority of her government. Her leadership acumen helped her realise that by developing one sector – the power sector – the government will be able to unleash growth potentials of all sectors of the economy. The Prime Minister wisely decided to appoint Nasrul Hamid Bipu as the state minister for power, energy and mineral resources and thus the country’s power generation has reached around 19,000mw that was only 3,000mw in 2009. The vivid sign of success is that earlier electricity would come sometimes, but now it rarely goes, which is obviously a paradigm shift in power sector. The success of power sector has also contributed to agricultural growth. The country has become self-sufficient in food production and there is no need for import. I would love to welcome all of you to the roundtable arranged by the daily sun in association with Summit Power Ltd. The group really deserves a big hand for standing by us in this noble cause. I must recall the contribution of private sector to massive power growth in the country. Had the government not included private sector in power generation, it would not be able to bring 92 percent people under electricity coverage so early. Expert manpower is one of the preconditions for optimum power generation. Therefore, private companies have been imparting training to its officials for an increase in quality and quantity of power production. Private power companies have contributed to employment generation in the country and constructive engagement of the people, leaving no time for them to be involved in drug abuse and other social menace. I call for privatization of transmission and distribution services to facilitate smooth and cost effective supply of power everywhere. If the private companies are tasked to handle power transmission and distribution, the government will be able to ensure uninterrupted and cost effective power supply. The Power Roadmap has two targets for 2021-- electricity for all, and sustainability, quality and affordability of electricity. Efforts are on to achieve these targets. BREB is one of the six electricity distribution companies of the country. But it covers 80 percent of the total population and deal with 60 percent energy of the country. Electricity coverage of the government till now is 92 percent which is 3.8 crore households in numeric numbers. Cent percent coverage will be fulfilled if we able to reach out to total 3.42 crore households, which means only 34 lakh households remained out of electricity coverage. The target will be fulfilled within this fiscal. Some may not believe that REB gave electricity to 39 lakh customers last year which was a milestone. During the last three years, REB provided electricity to 1.12 crore people. Now the challenge is to ensure quality power along with its frequency, voltage and distribution line development. It is true that load shedding is taking place in some places, even people are being harassed in some cases, but the government and its concerned departments are putting best effort to address these problems. Natural calamity is a major factor associated with interruption in electricity supply. We are trying to strengthen the distribution line. Export earnings from readymade garment (RMG) were $11billion when the current government took charge in 2009, but now it is above $30 billion. That means export earnings from this sector increased almost three times during this time. RMG industry is enjoying the advantage of huge power generation which helped to strengthen strong backward and forward linkage industries, lessening dependency on import. Today we can meet hundred percent accessories demand from our own sources. In the field of fabrics, garment sector can source around 90 percent of knitwear fabrics from local market, but we are still lagging behind in woven fabric production. It will require huge investment and infrastructure development. But, Bangladesh has shown its capacity in Denim fabrics production, the country can meet almost 50 percent of export oriented industry demand locally; almost 35 percent of other woven fabric demands are met by the local textile mills. The progress could have been made thanks to the availability of power, where we used to face crisis earlier. However, we would like to suggest the government to minimise the gap between the power production and production capacity. They have capacity to produce more than 19000MW, but the production is only 14000 MW, including the captive power production. The RMG industry is going through transformation by replacing mechanical equipments into electrical equipments. We used to use induction motor in garment factories but those have been replaced with servo motors. We also installed servo motors in old model machineries. The industry people also installing direct drive motor, which may reduce electricity consumption one third; many factories are replacing traditional halogen bulbs with LED bulbs. How long the government will allow production or importation of halogen bulbs? It is time adopt right policy decision. A few days ago many European countries banned use of halogen bulbs. Increasing use of energy efficient machineries in the RMG factories holds an example for the whole private sector. I think the garment industry has taken a leading role in reducing energy and water consumption. You know that we have 69 green factories and more 300 green factories are under consideration for getting such recognition. Bangladesh has top seven green factories out of ten in the world. The apparel industry is helping the government by using energy efficient equipment and energy efficient machineries. We are stand ready to cooperate in reducing the demand gap in peak and off-peak hours. Finally, I will focus on distribution line which is the main factor to provide quality energy to industry level. We hope to get a better distribution channel. Cost of doing business is very important to make any business competitive. If any sector losses competitiveness they cannot continue export business. Decent wages will increase day by day. So, the government should provide us utility services including energy at affordable rates. I think garment and others industries have huge potential to make Bangladesh a developed country, in line with the vision set by the government. We, the industry people are giving commitment that we will increase our capacity and at the same time will bring down energy consumption through installation of modern machineries. I would love to warmly welcome all of you to my today’s presentation styled ‘Bangladesh Power Sector: Road to Vision 2041’. The vision of power sector of Bangladesh is to provide reliable electricity to all at an affordable manner and ensure reliable electricity for all by 2021 through integrated development of generation, transmission and distribution system is its mission. The incumbent government has walked a long way in the development of the power sector of the country during the last two decades. As a result of timely and dynamic moves of the government, power generation growth of the country is 10.2 percent while total generation capacity is now over 20,000mw which was only 3,268mw in 2009. The country’s access to electricity is 92 percent that was just 47 percent in 2009, while consumers are over 30 million that was 10.8 million and per capita generation now stands at 464kwh. The government has set the power generation targets in three phases which are 24,000mw by 2021 that has almost achieved as the total generation capacity is now over 20,000mw. We have envisioned that the country will see a demand for power of 30,000mg in 2030 and that we have set the target at 40,000mw by then. The demand for power in Bangladesh could reach 48,000mw in 2041 and that the production target has been fixed at 60,000mw by that year. 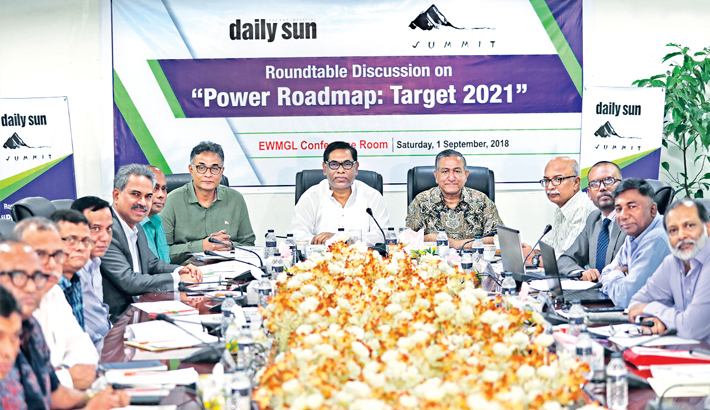 As part of the regional cooperation, Bangladesh is supposed to get 9,000mw by 2041 under PSMP-2016, while the country is now getting 500mg through Bheramara-Baharampur interconnection and 160mw through Tripura-Cumilla. Besides, upgrade of Bheramara for additional 500mw, 2nd Bheramara-Baharampur interconnection for 1000mw and Tripura-Cumilla interconnection for additional 500mw are underway. Upgrade of JV Hydropower Project to generate 1125mw power in Bhutan and Katihar-Parbotipur/Barapukuria-Bornagar 765 KV super highway are also in progress. Renewable Energy Policy of Bangladesh has been adopted in 2009 and the government has set a target of 10 percent of total generation from renewable energy by 2021. The current distribution line is 4,57,000km, while transmission capacity is now 11,123km and the total system loss is now 11.87 per cent. The power sector of the country has been reaping dividends of digitization as we have already walked a long way in digitization including introduction of smart pre-paid metering system. We have set the target of needed Foreign Direct Investment (FDI) in the country’s power sector at 82 billion while it now stands at 23 billion. Private sector is playing a vital role in holistic development of power sector of Bangladesh and we always encourage them to get into the sector. The main and major challenge for us is to ensure uninterrupted and quality electricity supply to our clients round the clock. Quick rental projects initiated by this government was earlier criticised by many people, but it is now being apprec-iated for being instrumental to power generation within shortest possible time. I also hail the government for engaging private companies in power generation for which the nation is reaping the benefits. Now-a-days, I see uninterrupted power supply in every rural area. The government has no alternative to power for future development of the country. The smart prepaid meter introduced by the government in the urban areas must be available in rural areas. Development, good governance and transparency are interrelated. The government has rightly introduced smart prepaid meter to rid consumers of ghost bill. Bangladesh’s power general capacity was less than 5,000 megawatts when the Awami League-led government assumed office in 2009. Power Division data updated on August 19 suggest the capacity has been augmented to 19,202MW (including captive generation) over the last nine years Awami League in office. The number of power plants has increased to 123 from only 27 in 2009. The electricity coverage has gone up to 92 percent with three years left before the 100 percent coverage target. Today we will have discussion on the progress towards achieving the targets in the power roadmap formulated by the government. We will also discuss the primary energy issue as well as the ways to make electricity more available. The unit-1 of the Matarbari 1200MW coal-fired plant will commission by January, 2024 and another unit of the plant by July, 2024. Coal transportation is a major challenge for implementing the coal-fired plant. So we are making a 14.5-kilometer long and 18.5-meter deep route to ensure entrance of 80,000-tonne capacity mother vessels into Matarbari deep seaport under construction. Chittagong, Mongla and Payra ports have no deep port facilities like Matarbari. We are hopeful of completion of the Matarbari deep seaport channel by 2022. Tremendous development in power sector is encouraging for the country and its people. We are happy to know that Electricity coverage has reached 92 percent in the country. But the authorities must shift their attention to uninterrupted and quality supply of power. Demand for electricity is increasing for multiple uses. A future roadmap on the part of the government is needed to hike power production considering the future demand for electricity.